At Oriental Express, we know the value of cleaning and cleaning well. Now that spring is rolling around, many people will be diving into the proverbial cleaning that’s supposed to happen at this time of year. Time to move the furniture, empty the fridge, and prepare our homes and businesses for the rest of the year. Making the most of your cleaning when you have great upholstery or oriental rugs is easier when you have help from our professional team. We want to take today’s blog to share some helpful tips for making your spring cleaning quick, easy, and thorough. Some people (like us) love to clean things. We love to see the colors in oriental rugs, upholstery, and beyond shine brightly again. However, some people really hate cleaning and would rather do anything else. 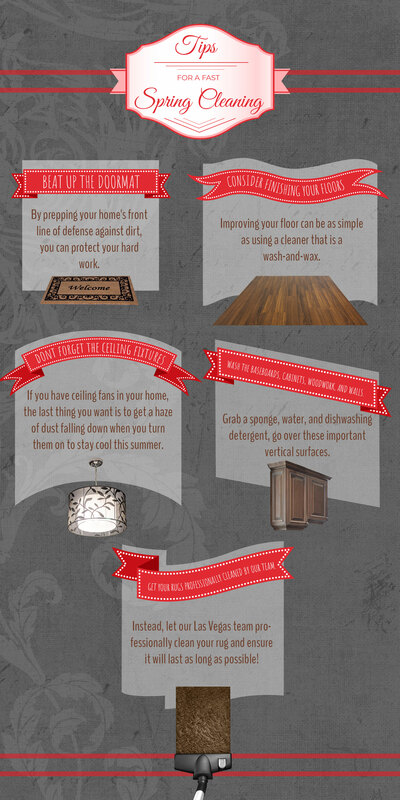 Here are some ways your cleaning can go more smoothly whether you love to do it or not! If you’re going to be cleaning the inside of your home, it’s worth making sure the mat can do its job and keep additional dirt from getting inside. By making sure your home’s front line of defense against dirt is ready to do its job, you can protect your hard work. For most people, the kitchen floor won’t have carpeting and probably will benefit from some kind of new finish. Kitchen floors take a lot of abuse, including spills, scuffs, and dropped pots. Improving your floor can be as simple as using a cleaner that is both a wash-and-wax. By doing so, you can refresh the floor and give it a protective coating at the same time. Don’t forget the ceiling fixtures. If you have ceiling fans in your home, the last thing you want is to get a haze of dust falling down when you turn them on to stay cool this summer. The same goes for air conditioner or heating vents, which can blow dust around right when seasonal allergies are setting in. When cleaning a fan, it’s usually best to use a cloth. A vacuum with a soft attachment is great for cleaning vents. And while you’re cleaning the vents and fans, give your light fixtures some attention. Chances are good they’ve collected plenty of dust and probably a dead bug or two. Wash the baseboards, cabinets, woodwork, and walls. Get your rugs professionally cleaned by our team. Your rugs have likely been cleaned throughout the year, but regular vacuuming only removes some of the dust, oil, and germs. These contaminants will dull the beauty of these beautiful materials. Instead, let our expert team professionally clean your rug and ensure it will last as long as possible! Contact us in Las Vegas for oriental rug cleaning today!